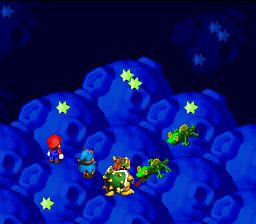 Fun & Run is a physical attack used by Geckos in Super Mario RPG: Legend of the Seven Stars. The Gecko attacks one person in Mario's party, sticking out its tongue to cause mild damage to the victim. After using it, the Gecko runs from battle. This page was last edited on April 12, 2018, at 12:55.